UC-DC - This under counter water filter connects directly to the cold water line, eliminating the need for a separate faucet. Filtered water is dispensed from your main kitchen faucet (cold water only). This is designed for applications where drilling a hole for a separate faucet may not be desirable, such as granite or porcelain sinks. 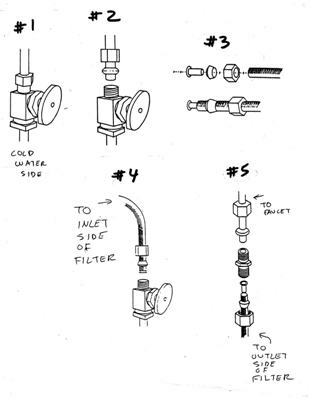 Special compression thread hardware is included to connect onto the cold-water stop valve, and then back onto the cold-water riser line - see diagram below. Contains the KDF/GAC cartridge (12,000 gallon rating) in a single space-saving housing. Cartridge has an integrated 1 micron absolute prefilter that can capture cysts (cryptosporidium, Giardia). Includes high pressure polyethylene tubing, mounting bracket, and housing wrench. Quick-connect fittings make installation a snap! Includes chlorine test strips to verify when it's time to replace cartridge. 12" tall, 5" diameter. 3 year prorated warranty on cartridge, 5 year on components. Note: life on cartridge will be shortened considerably compared to units with a separated faucet due to filtered water being used dishwashing, etc. Take your pure water along in a colorful Nalgene 32 oz. water bottle! Click HERE for more information. Store your water in a handy 2 gallon refrigerator bottle! Click HERE for more information. UC-DC - Compare at $159.00, YOUR PRICE - $99.00, with FREE SHIPPING (in U.S.)! 30 day money-back satisfaction guarantee!